Prig Gang Leung, southern sour curry paste is also known as yellow sour curry paste because of the bright yellow color of the curry. The southerners, however, call this curry 'sour curry'. 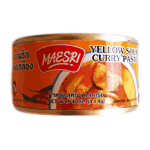 But elsewhere, especially in Bangkok, this curry paste is known as yellow curry paste. Southern sour curry paste is different from central sour curry paste because of the added fresh turmeric. Otherwise, the pastes are the same. Perfect with fish.